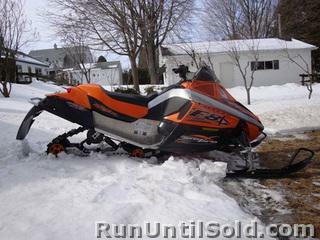 2007 Arctic Cat F8 Sno Pro - Price reduced!! Seller 82der assumes all responsibility for the listing and deleting of this ad. Purchased Brand new this year. Orange. 780 miles on 3 trips this year. 102 picks on center row staggered, Orange skid plate. Awesome sled, very fun and easy to ride. $5400. Must sell. Purchasing new home, willing to deliver if necessary at customer cost. Pictures available at customers request. 82der: You may EDIT your ad Description, or Delete your ad.